Subscribe to Custom Free Search Results via RSS! Create as many as you like. We have now added RSS feeds to the Free Search. The next step depends on what browser one uses. If FireFox, it'll offer to save the link as a "live bookmark". Chrome displays the raw content. Either way, one can use any number of RSS Readers out there. 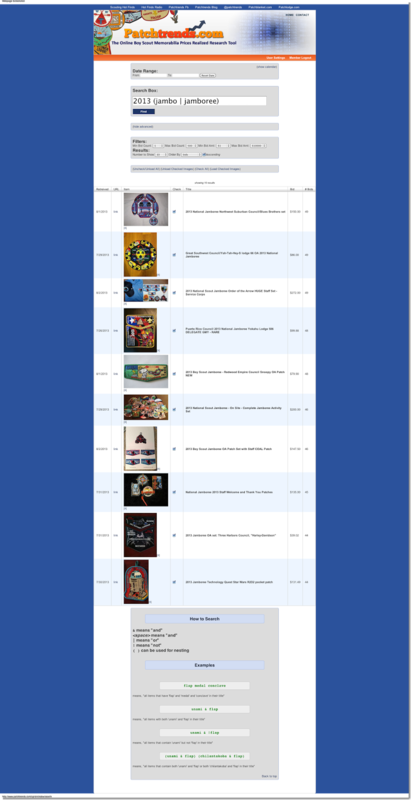 The reader will now update the items in the list as Patchtrends.com adds new items. There is no limit to the number of customized search feeds one may create, so go for it! Free access ends Monday, and we're not going to any promotions for a long while. With all of the data that Patchtrends.com is collecting daily, it is interesting to see what kind of facts one can derive. For example, at last count since the beginning of the year less than 20% of the auction listings for Boy Scout Memorabilia have actually sold! 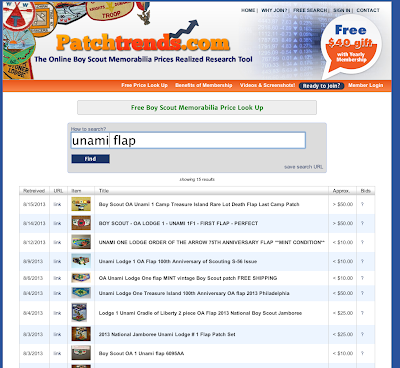 Only the member search of Patchtrends.com will show the unsold items, which is information that is arguably as important as knowing what an item sold for. The free search is useful, but not for deeply analyzing these trends. Many auctions that we track are also the same item relisted over and over again for the same price. Seems like Einstein's definition of insanity certainly applies here. This, however, presents a huge opportunity for buyers who are interested in less popular items. There are tremendous steals out there for older and rarer items. But because people don't know about them or collect them, they sit unsold. Find those hidden treasures! We have been hard at work making the free search something that is useful for those not yet ready to make the jump to full membership, yet enticing enough to make them realize the value of such a yearly membership. Below is a summary of the recent changes. Following this description is a summary of upcoming enhancements that we hope to implement very soon. When you search in the free search section, one will see tiny thumbnails of the images. While some of the most recent images may not be available immediately, most are. However, the images are not the full size and large images one will see in the membership search. It's useful, but still not what most may want. The full membership search has much larger thumbnails and links to the full size images. The image below illustrates results for a search of Unami flaps. One may now link specific searches in the public search section. For example, the following URL contains the search terms. Once loaded in the browser, the search is immediately triggered as if the user clicked the "find" button. It's very convenient for linking to searches one may submit frequently. Once a set of search terms has been found, one may generate the permanent search link easily by clicking the "save search URL" link. A window will pop up with the encoded URL that may be copy and pasted anywhere. This feature has a lot of room to develop, but the core functionality is there. Each item that shows in the limited listing has a link that points back to the eBay auction with full information on the item. This convenience was added so that users could find out the details and find an item like it for their own if so desired. The free search is being improved for casual use, but those interested in more detailed information and a more efficient user interface will definitely want to join Patchtrends.com as a member. More on the benefits of membership may be seen at Patchtrends.com. Please stay tuned for more posts about using Patchtrends.com and how we're constantly striving to improve this resource for the hobby. 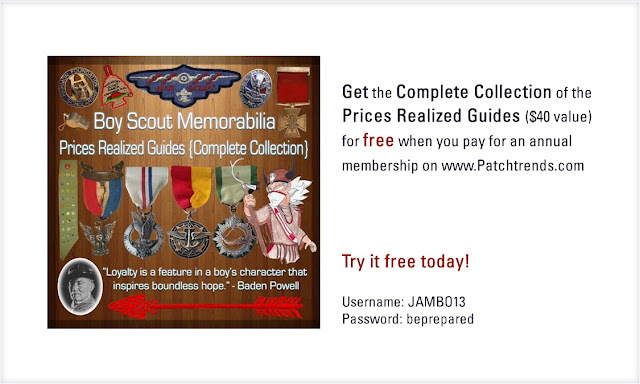 We have updated the free search for Boy Scout Patch Values to include small images. Please visit the FREE SEARCH HERE! And consider joining as a yearly paid member for a much nicer interface and a free gift! 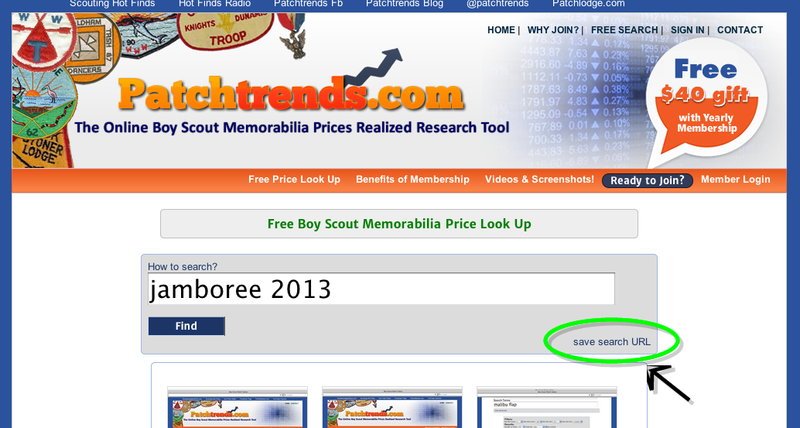 If you're interested in finding the true value of that Boy Scout patch in your hand or if you want to find out if you're about to over pay for a particular item, follow the instructions for free access to Patchtrends.com Boy Scout memorabilia pricing data in the attached image. If you'd like to beat the rush and join, visit http://www.patchtrends.com/cgi-bin/index/join. 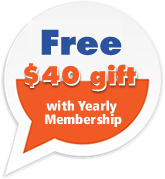 And don't forget about the free gift for all new yearly account sign ups - a $40 value! While we make no promises of 100% uptime for our Boy Scout Patch Price Guide service Patchtrends.com, recently we have been plagued with some run-away processes on the server. This should be resolved now, if not we'll get to the bottom of it asap. 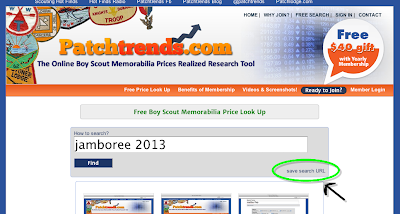 The top 10 most popular 2013 National Boy Scout Jamboree has been shake up quite a bit this week. The lowest number of bids in the top 10 is 44, the highest 49! The 2013 National Jamboree Northwest Suburban Council/Blues Brothers set, the Great Southwest Council/Yah-Tah-Hey-S lodge 66 OA 2013 National Jamboree, and the 2013 National Scout Jamboree Order of the Arrow Staff Set have proven to be the most popular. 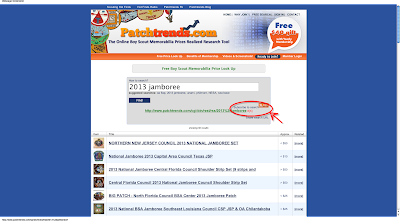 You may have ready access to this and many other data by joining Patchtrends.com today!